For the second time thus far on Spontaneous Lunacy – heck, for the second time in the last four reviews alone! – we’re faced with a record wherein both sides are mere variations on a theme, two sides of the same coin if you will, or quite frankly, virtually the same basic song under different titles! Yet as in Smiley Lewis’s case earlier, here with Jimmy Liggins, despite the songs obvious similarities I find that I have a definite preference for one over another. Moreover that preference seems contrary to the (admittedly slight) consensus opinion of what I can find written about each, as well as the apparent tastes of those who weighed in at the time when this record was new. Oh well, that’s why we all don’t share the same ears. Almost two full decades into the 21st Century the concept of the “single” as it existed for much of last century is probably hard for people to grasp. Like many of you no doubt I came of age well past the singles era that was defined by a 45 RPM vinyl record (or, in this case, a 78 RPM record, even more fragile than its successor, the 45) and so I never experienced what it was like to buy a record, bring it home, put on the clear-cut “hit” side (whether or not it became a hit was another story, but there was usually some sense of which side the company and artist were banking on becoming a hit) and then, after wearing that out, tentatively flipping the record over to “see what they put on the other side”. In the digital age you buy (wink-wink) the song you want, usually after hearing it for free through countless spins on various platforms designed for such prodigious sampling. It’s a method that takes away much of the mystery and uncertainty of the entire process, the wonder of what is waiting for you on that black disc in your hands inert and lifeless until you drop the needle into the groove. But that part of it, though largely lost or at least altered by taking away the physical possession of a record, is minor compared to the disappearance of the B-side and all it entailed. The question of course is what the B-side was MEANT to do in the first place. It seems that it was a circumstance forced upon record companies by virtue of how records themselves were manufactured, giving them a two-sided playing surface rather than just one. I think if anyone put any forethought into the commercial aspects of it before the record industry finalized the construction of the standard disc they surely would’ve tried to come up with a one-sided record instead. It just makes more sense. Two for the price of one may be a reasonable lure to get a potential customer to shell out the cash to buy it but ultimately the strength of the top side, the one all of the effort went into, the one that contained their best ideas, the side that was promoted in ads and pushed on radio (later on anyway, once radio began playing this stuff we’re covering) would ultimately be what sold it or sank it. The record companies weren’t always right in their selection for the plug-side of course, there’ve been quite a few B-sides that quickly became the sought after song and in effect became the de facto A-side commercially and historically, but for the most part there was a clear cut difference between the two songs that was apparent on first listen. Furthermore having two songs on the same platter with equal appeal was somewhat counterproductive. Two great songs on their own would result in two separate sales, thus twice the profits, yet paired together wouldn’t get you so much as a dime more. You were paying for the record itself regardless of what was on the other side and you weren’t shelling out extra if that B-side was better than expected. Because of this reality many would eventually start putting out intentionally subpar throwaways on the flip sides, not wanting to waste a good song that might be used later to garner sales on its own thereby taking the first step in changing the entire nature of the single release. Then you had the problem of splitting the profits when two songs were used that had different songwriters and/or publishers. The royalties stipulated each got an equal share of the total sales price and if a hit song on one side was responsible for those sales its author and publisher would be getting hosed if the B-side that most ignored had different songwriters and publishers who’d get the same amount just by piggy-backing on their hit. But the B-side HAD value artistically, despite these economic quirks (and in fact, on jukeboxes they had value commercially too, as two good songs on one record – out of just 20 or 25 in the box – meant they might get twice the plays, giving jukebox op’s more of a reason for stocking it). At their best B-sides gave artists a chance to showcase different facets of their style to the public, as they often found themselves compelled to keep following up hits in one style with more of the same so as to appeal to the audience that liked that approach in the first place. But that can get monotonous, not to mention stifle any further experimentation, so by having a song in an entirely different vein on a B-side meant their creative urges had at least a chance of getting some fulfillment. Who knows, maybe the flip side would be a hit on its own and thus give the record label reason to encourage more experimentation rather than sticking solely to the already established hit sound on the A-side. But here, as with Smiley Lewis on Here Comes Smiley and Turn On Your Volume, Baby, offering a variance of approach was clearly not the case. In both instances the A and B sides of Liggins and Lewis’s records are virtual carbon copies. In pacing, instrumentation, just in overall vibe. Yet despite those evident similarities it’s the few subtle, but notable, differences that make and break them and ultimately sets one side apart from the other. When comparing the two songs served up by Jimmy Liggins certain things stand out as similar – the horn intro for one – and as different – the lack of emphasis on the first drum pattern following the horn intro. As the similarities pile up, notably the melodic groove and the vocal pattern that sits astride it, what becomes evident is where they diverge and as a result what’s downplayed or left out altogether winds up creating a substantial difference. In I Can’t Stop It the drums kicked in with a brief but vicious sounding solo that seized your attention right away. What followed was a crisp galloping pattern – aided by the piano playing a simple but effective bassline – that gave the entire song a very real momentum which Liggins then steered with confidence. The song seemed to surge forward, restless and full of energy raring to be released. By comparison Troubles Goodbye seems lethargic in that regard. The drums sound muffled, the piano sluggish, the lyrical couplets, while effective on paper, are lacking the hard-charging enthusiasm that marked the flip-side as something special. Worse still is the absence of the call and response vocals, the defining aspect really of what made I Can’t Stop It so infectious. Their presence gave the impression of a rousing party that everyone was in on, an atmosphere of all-inclusive excitement that was then conveyed to the listener. Here that gets replaced with drawn out horns at the end of each refrain, featuring the more old-school sounding trumpet and alto sax, giving it a subdued climax in contrast to the vibrant rally that followed each of the verses on the former. Because of this Liggins’ vocals are forced to employ a very abrupt stop/start pacing giving it a bit of an unnatural feel. No sense of flow is maintained making it all seem very choppy by nature. He still gives it his all, his enthusiasm never wanes, but he’s not a gifted enough vocalist to add much to it outside of just riding the melody and so when that melody drags so does the performance. You wait for him to take off, ratchet up the excitement and cut loose but he’s never really given the chance. Go Out And Party From Five ‘Til Five! Now to be fair when Harold Lands gets a chance to strut his stuff on the first sax solo it picks up considerably. If anything it may be an even more romping performance than is found on the flip, while it lasts that is… but then just as suddenly it stops dead, cutting the momentum it was building and downshifting to a lower gear as Liggins picks up the vocals again. I doubt it was an edit but the effect on Troubles Goodbye is jarring all the same. Had they let that solo go on longer, even had Liggins start chanting something over it as he moved back towards the microphone as the sax backed away, the result might’ve surpassed any specific moment on I Can’t Stop It. Instead by ending abruptly as it does it’s like having a bucket of ice water dumped over you for enjoying yourself too much. The second solo by Charlie “Little Jazz” Ferguson tries to make up for it and largely succeeds. It sounds like fighter jets have swooped down on the studio and are blowing everything to smithereens. The other musicians pick up their pace and this time they’re all allowed to keep going and as a result they close the proceedings with a flourish, leaving the listener with a sense that the entire record was every bit as good, as infectious, as I Can’t Stop It. But it’s merely a mirage, a slight of hand. A very smart one to be sure – finish strong and it will make you forget the earlier weaknesses, like a good desert can save a dried out pot roast and lumpy mashed potatoes. When taken as a whole however the sum of the parts don’t add up to quite as much. Troubles Goodbye is better than average but it’s not approaching the level he’s already shown us he was more than capable of reaching. I suppose I’m contradicting myself by first stating that the A and B sides of records should emphasize their differences in order to give much needed artistic diversity to the release, then turning right around and saying that it’s those differences that makes this inferior and they should’ve followed the pattern set on the other side. But while that might be what I inferred, what I really mean is that you can’t follow something SO closely that the similarities stand out but then eliminate the best parts of the original idea. In other words they should’ve just cut a damn ballad and thus made absolutely sure they were as different as night and day. 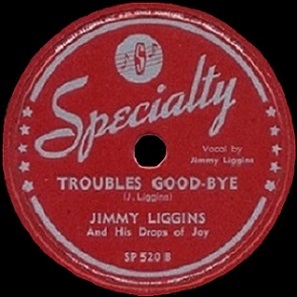 Leave a reply on "Jimmy Liggins: “Troubles Goodbye”"